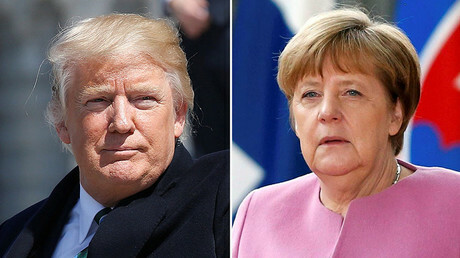 US President Donald Trump and German Chancellor Angela Merkel have met for the first time in Trump’s time in office, discussing many issues on which the two have disagreed in the past, including immigration, defense spending and free trade. “Our two nations share much in common, including a desire for security, prosperity and peace,” Trump said. He praised Germany’s training of an industrial workforce, including “harnessing the full potential of women,” as an example the US can look to as it seeks to rebuild its industrial base. On NATO, which Trump has heavily criticized because he feels that other members “don’t pay their fair share,” the president extended an olive branch, but repeated his demands for other countries to step up. He also thanked Merkel for her commitment to increasing defense spending, as well as for her leadership in supporting NATO in Afghanistan, at the cost of the lives of more than 50 German soldiers, and as member of anti-ISIS coalition. “I thanked her for leadership, along with the French president, in resolving the conflict in Ukraine, where we ideally seek a peaceful solution,” Trump said. Pivoting to immigration, a topic on which the two leaders have vastly different views, Trump said the focus must be on national security. Our alliance is a “foundation of a very hopeful future,” he said. Merkel reiterated the points of agreement with Trump, including saying that Germany also needs to increase military spending as the country continues to work in Afghanistan, Syria and Libya. “We had a very good first exchange of views,” she said. She praised Trump for the US commitment to the Minsk process on Ukraine. “There has to be a safe and secure solution for Ukraine, but relationship with Russia has to improve as well,” she added. 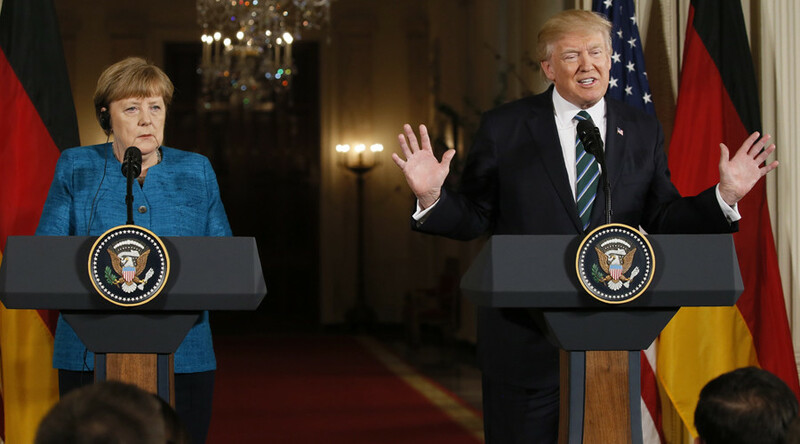 Merkel agreed with Trump that “trade has to be fairer, has to be a win-win situation,” adding that “globalization ought to be shaped in an open-minded way, but also in a fair way.” For his part, the US president stressed that he doesn’t “believe in isolationist policy,” but rather wants free trade as long as it is also fair to the US. At the same time, Merkel called on the US to “come back to the table and continue [TTIP] talks,” referring to the Transatlantic Trade and Investment Partnership, which is among the free-trade deals that Trump wants to get away from in favor of bilateral agreements. Merkel argued that the TTIP is, in fact, a bilateral deal because it is only between the US and the European Union. “A free trade agreement with the US has not always been popular in Germany either,” she added. During the question-and-answer period, Trump discussed the GOP’s American Health Care Act to replace Obamacare. He promised that any Republican lawmakers who had previously opposed the bill for not being conservative enough had come around and would vote for the bill. Trump has repeatedly stood by his accusations that his predecessor wiretapped and otherwise surveilled Trump Tower in New York ahead of the 2016 presidential election. A bipartisan group of lawmakers investigating any wrongdoing by the Obama administration when it comes to spying on Trump have disputed these claims, saying there is no evidence.